"Maine General Hospital, Portland, Me." Maine General Hospital, Portland, Me. 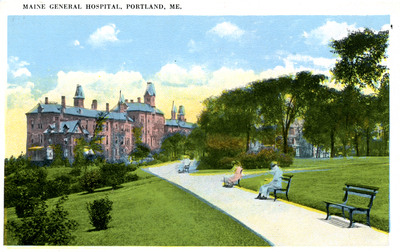 Full exterior view of Maine General Hospital (later, Maine Medical Center), with adjoining portion of the Western Promenade, from east, circa 1900s. Published by Chisholm Brothers, Portland, Maine. "Maine General Hospital, Portland, Me." (2013). Portland Postcards. 20.